Blue Man Group Releases Trailer for Upcoming Book, "Blue Man World"
Blue Man Group gives fans a sneak peek of how their first-ever book, "Blue Man World," was made with the release of a trailer on the group's YouTube page. 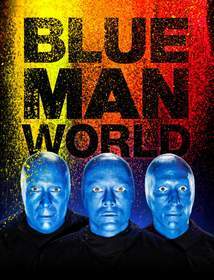 Available October 2016, "Blue Man World" is a graphically rich, textually dynamic, cheekily clever deep dive into the world of the Blue Men, as well as a hilarious cultural satire. Including archival photographs, specially commissioned artwork, infographics and interviews with Blue Man experts (both real and potentially not real), it answers all the burning questions including: Who are these Blue Men? Where do they come from? Why are there only three of them? What drives their curiosity? What do they hope to accomplish? Published by Black Dog & Leventhal, "Blue Man World" is available for pre-order now at Amazon, Barnes & Noble and IndieBound. Customers who upload their pre-order receipts for "Blue Man World" before 11:59 p.m. 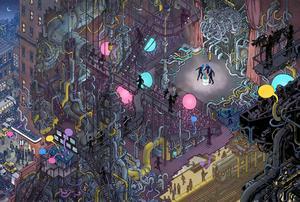 ET on Oct. 3, 2016 to www.blueman.com/25/bluemanworld will receive a commemorative 'Even More Tubes' poster commissioned from artist Andrew DeGraff, celebrating the publication of "Blue Man World" and 25 years of entertaining more than 35 million individuals in over 15 countries. "Blue Man World" is one of several new Blue Man projects in 2016 as the global entertainment phenomenon celebrates 25 years of living in full color. For an inside look at the milestone year, including the recent release of the group's third studio-album, THREE, visit Rolling Stone, The Hollywood Reporter and Billboard Magazine. In 2016, global entertainment phenomenon Blue Man Group celebrates 25 years of living in full color with a series of new projects and appearances. The company is best known for the award-winning Blue Man Group show, performed in over 15 countries and seen by more than 35 million people worldwide since 1991. A dynamic combination of music, comedy and technology, the show appeals to a broad range of age groups and cultural backgrounds. It is continually refreshed with new music, fresh stories, custom instruments and state-of-the-art technology. The company developed through a creative collaboration among three close friends, Chris Wink, Phil Stanton and Matt Goldman on Manhattan's Lower East Side. Blue Man Group now has permanent theatrical productions in Las Vegas, Orlando, Boston, Chicago, New York and Berlin, a North American tour and a World Tour. This creative collective is part of the pop culture zeitgeist. Beyond the stage show, they have toured the globe with the "Megastar World Tour" rock concert parody, released 6 albums, including the latest album, THREE, and the Grammy-nominated Audio, and contributed to numerous film and TV scores. They've served as the face of branding campaigns for Intel and TIM/Brasil and appeared countless times on hit shows like "The Tonight Show", "Arrested Development", "Ellen", "Schlag den Raab" (Germany), "WOWOW" (Japan), and "Caldeirão do Huck" (Brasil). Black Dog & Leventhal, an imprint of Hachette Books, has established an excellent worldwide reputation for creating a quality, varied and inventive program of nonfiction and illustrated books. It publishes in a wide range of subjects that include art, history, science, humor, cooking, crafts, music, theater, and more, as well as a small vibrant list of children's books for school and home study. The impressive range of the list is evident in their bestsellers, which include The Complete Cartoons of the New Yorker, Skyscrapers, Take Me Out to the Ballpark, The Complete Front Pages of the New York Times, The Louvre: All the Paintings and Theodore Gray's The Elements. "Blue Man World" - available on October 4, 2016.